Our beloved Golden dream boy, Nicky, was diagnosed in March, 2017 with a very rare lymphoma. He had been doing amazingly well and was living a very normal life. He was enjoying the summer months at the beach, playing with our 2 year old Golden Retriever, Cooper, swimming, running and eating like a champ with all of the home cooked meals. On September 12th, 2017, Nicky had (what was to be) his last check-up with one of our vets. All checked out great during his visit and we were told to get in the ocean and swim, which seemed to be agreeing with him. While in line to check-out, Nicky collapsed. His gums were immediately grey and he lost control of his bladder. What?! How could this be happening?! We had to quickly bring him to the Emergency Center for an immediate ultrasound. 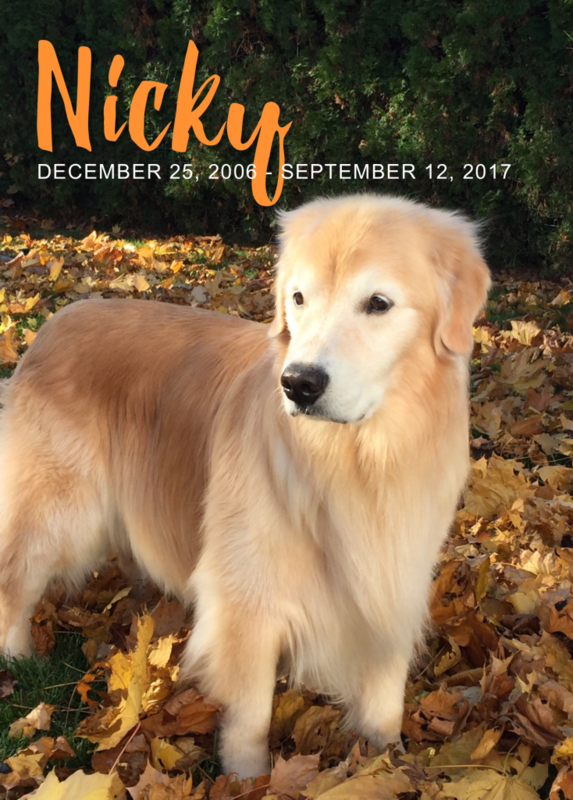 The unthinkable was happening; Nicky had a Hemangiosarcoma of the heart. How can this be??? He passed peacefully in our arms. We are and have been beyond devastated. Why did this have to happen? Please, if you have a dog that is currently battling cancer, have lost a dog to cancer, or know someone who’s dog is currently fighting for their lives, please help us to raise money and awareness.